Companies are using technology for good! Organizations like Toyota are using it to literally save lives. We have really had fun (I mean that!) making technology focused videos over the years with some of our amazing clients and partners. Companies like American Well, Microsoft, Blink for Home, SharpSpring, Bright Rectangle Films, Cognizant, just to name-drop a few! When Toyota first called us about this project, the technology they were describing sounded pretty complicated. But when simplified, the idea was ‘simply’ that the city was going to use traffic cameras in a way never used before. The city of LA is now able to use data gathered from the camera footage to help measure traffic patterns. With ‘machine-learning’ this data is going to assist in changes that create a smoother and safer traffic flow in the city. And will save lives. It was actually startling to hear that hundreds were dying every year in that area from traffic accidents (over 200 a year!) With that in mind, what could seem like a somewhat boring technology project for geeks proved important and meaningful. We jumped on a plane, grabbed some gear at a rental house and began our filming around the city. Our Waves Media team was able to interview various people with totally different perspectives from engineers to city officials. And the story came together. We trounced around the city as well to gather the footage you see below in our mini-story. Oh, and it was hot (105 degrees that day!) Our major focus was to keep the cameras from over-heating – and we did! 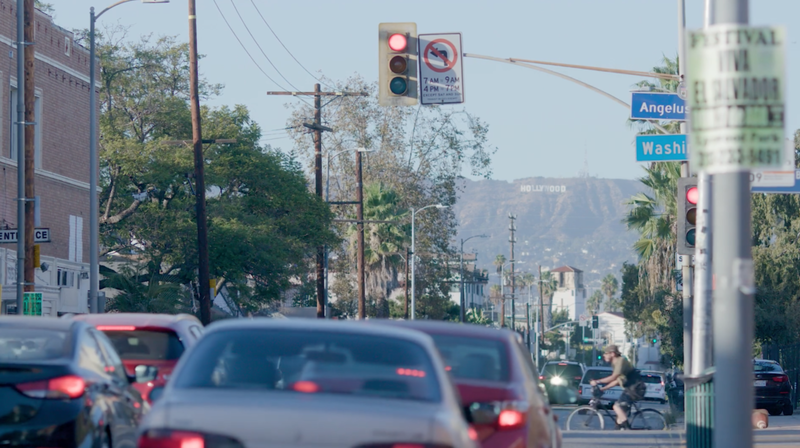 Toyota and the LA DOT Initiative from Waves Media on Vimeo.